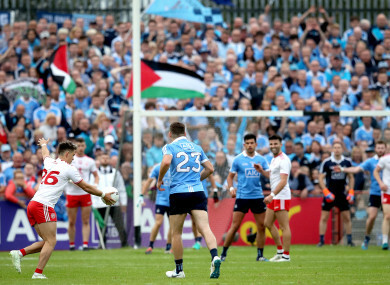 We meet again: Dublin were three-point winners away to Tyrone in the Super 8s. DUBLIN LEGEND CHARLIE Redmond believes discounting Tyrone’s chances in this weekend’s All-Ireland final against Jim Gavin’s men would be ‘delusional’. The Dubs march on Croke Park with immortality within their grasp – ready to make history with a fourth consecutive All-Ireland crown. Not since the legendary Kerry side of the 1970s and 80s has a county achieved the feat, but Redmond is not overlooking the threat posed by the Ulster side. “Absolutely they do have a chance, absolutely they do,” he tells The42. “Anyone who thinks anything else is deluding themselves. “Call a spade a spade. They’re not coming down here to walk around behind the Artane Boys Band and just make up the numbers – for them to just be there on the day. They’re coming down with every intention of winning this game. Tyrone missed out on provincial glory after their two-point defeat to Monaghan in the quarter-final of the Ulster Championship. Harte’s men atoned for the defeat when they edged the Farney Army by a solitary point to book their place in Sunday’s final. Most believe for Tyrone to overcome the defending champions, both Harte’s gameplan and the team’s performance needs to be flawless. Redmond pointed to this year’s hurling championship final as evidence that even those heavily favoured can always succumb to a shock defeat. “People will tell you that Dublin have all the experience of All-Ireland final days and how you go about setting up. “But that didn’t happen two weeks ago for Limerick, did it? They came into the game with an inexperienced team and we all know what happened there. Charlie Redmond, former Dublin footballer, was speaking ahead of the final episode of AIB’s new series, ‘The Toughest Rivalry’, which features his club Erin's Isle. Redmond, of course, has his own colourful history in All-Ireland finals. In the early 90s, the forward missed crucial penalties in defeat to Donegal and Down in the 1992 and 1994 centrepieces. “The disappointment of losing an All-Ireland if you haven’t experienced it is indescribable. You go to bed on a Sunday night and you feel shite. The world is falling in on top of you. But most notably in 1995, when Dublin last took on Tyrone in the All-Ireland final, Redmond’s legend grew. His first half-goal against the Red Hand was blemished when he was shown a red card by referee Paddy Russell. What ensued was four minutes of calamity as Redmond remained on the pitch before he was once again told by Russell to make his way to the sideline. The Erin’s Isle man relays what was going through his head as he took his seat on the bench. “I looked up the sideline at Dessie Farrell, Mick Galvin and Jack Sheedy. The four of us were the mainstays of the Dublin forward line for the last three years and here we were during an All-Ireland final and the four of us sitting on the sideline looking on. Redmond admits that defeats in All-Ireland finals in years previous ‘left marks’ but that defeats of that nature can lay the foundations for remarkable achievements. Dublin’s 2014 semi-final defeat to Donegal, he explains, is a perfect example of Jim Gavin’s willingness to learn from those losses. “Within 24 hours of that match, the management team sat down and looked at the video of that game repeatedly. They identified their mistakes and vowed to find a way past this blanket defence and this gameplan of the counterattack. “To their credit they’ve done it tellingly, to this stage. It’s clear that that game did leave a huge mark on him. As for his counterpart in the opposing dugout, Redmond believes Mickey Harte has shown remarkable resilience to make it back to the biggest stage in Gaelic Football. “Most managers might be able to build one and if you’re very good you might be able to build two. To build three shows and absolutely extraordinary talent. “He’s got the energy and the drive within him to keep going. He loves his football, you can see that in him. Email “'Tyrone are not coming down here to walk around behind the Artane Band'”. Feedback on “'Tyrone are not coming down here to walk around behind the Artane Band'”.